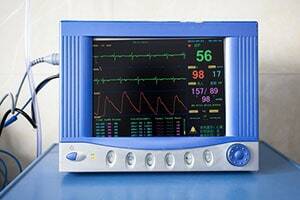 During the childbirth process, a baby's heart rate is monitored through a fetal heart monitor as a means of assessing the baby's oxygenation, including oxygenation of the baby's brain. The fetal monitor produces a strip which must be read and analyzed almost continually during the birthing process to determine whether the baby's heart rate is suggestive of oxygen deprivation. A normal variation in the fetal heart rate is a reassuring sign of fetal well-being. So fetal monitor tracing show fetal well-being (heart rate, heart rate decelerations, heart rate accelerations) or fetal distress (late decelerations with decreased variability). Mistakes and improper use of the fetal heart monitor are far too commonplace and can often have serious consequences. A review of birth injury malpractice cases reveals that EFM mistakes tend to fall into 3 categories: (1) ignoring EFM warnings; (2) misinterpretation of EFM patterns; and (3) failure to use or improper setup of EFM devices. Below are sample verdicts and reported settlements from recent medical malpractice cases for each of these EFM mistake categories. Plaintiff v OB/GYN (Massachusetts 2018) $5 million: mother was admitted to labor and delivery at 4 am and put on a Pitocin drip to induce labor. Fetal monitoring patterns were normal until around 4 pm when the mother began experiencing sudden pain. The fetal monitoring tracings remained at category II but became non-reassuring around the same time that the mother reported pain. The doctor chose to ignore the non-reassuring EFM patterns and continued the Pitocin drip. Over an hour later it was discovered that a uterine rupture had occurred and an emergency C-section was performed. The baby had no heartbeat at delivery, requiring resuscitation and was diagnosed with hypoxic ischemic encephalopathy. The parties agreed to settle the malpractice case for $5,000,000. Epple v Umstead (Florida 2018) $6.6 million: mother with high-risk pregnancy was admitted for labor at 42 weeks. FHR monitoring initially showed normal accelerations and absence of decelerations. Several hours later, however, the monitoring strips began to deteriorate with diminished fetal heart rate, variable decelerations and absent accelerations. The nurse called the OB/GYN at home to report the situation and EFM tracings, but he told her to continue with labor and vaginal delivery, at which point the doctor went back to sleep. The jury in Pinellas County found the doctor was negligent in ignoring the EFM warnings and awarded total damages of $6,684,673. Burke v Regional Medical Center (Alabama 2018) $6.5 million: admitted to the labor and delivery unit of Northeast Alabama Regional Medical Center (RMC). Fetal monitoring devices immediately indicated signs of fetal distress but these signs were initially ignored. Doctors continued to ignore the EFM warnings and allowed the fetal distress to evolve into a sinusoidal heart rate before finally attempting to intervene. By the time the baby was delivered she had suffered severe brain damage and was diagnosed with cerebral palsy. The doctors were found to be negligent in their decision to ignore the EFM warnings until it was too late. Florez v Northshore Univ. Hosp. (Illinois 2018) $50.3 million: doctors and hospital staff at a Chicago hospital allegedly failed to correctly interpret the heart rate patterns on the fetal monitoring devices which should have warned them that the mother's uterus was hyper stimulated in response to the use of Pitocin. Had they correctly interpreted the FHR tracings they could have recognized the danger and performed an emergency C-section. Instead they allowed the labor to continue and the baby suffered oxygen deprivation causing HIE brain injury and resulting in cerebral palsy. A jury in Cook County awarded $50.3 million in damages. Doe v Hospital (California 2017) $1 million: mother was admitted for labor and delivery 5 days past her due date. Fetal monitoring strips that afternoon and evening showed increasingly non-reassuring findings but the nursing staff at the hospital apparently misinterpreted the patterns and failed to appreciate the potential danger. As a result of this misinterpretation of the EFM tracings the nurses did not call in or alter the doctor. When the doctor eventually arrived he immediately delivered the baby but it was limp and not breathing and had to be resuscitated. An MRI confirmed that the baby suffered a massive brain injury from oxygen deprivation during labor. The parties agreed to settle the case for $1 million. Wilson v AMISUB of S.C. (South Carolina 2009) $4.5 million: mother was admitted to hospital for early labor and under the supervision of a nurse in training. After several hours cervix was not dilated and nurse informed doctor that fetal monitoring strips did not show any late decelerations. Based on this information mother was sent home. However, the nurse had misread the EFM patterns which apparently did show late decelerations with each contraction which should have prompted immediate delivery. The mother came back to the hospital the next morning and the baby was immediately delivered but the damage had already been done. The baby was eventually diagnosed with spastic quadriplegic cerebral palsy. A jury in Charleston awarded $4.5 million in damages. Coates v. High Point Family Med. (Wisconsin 2018) $4.5 million: mother with preeclampsia was admitted for labor at 38 weeks. Doctor opted to induce labor with Cytotec which was administered vaginally. After administering the Cytotec the mother was taken off the electronic fetal monitoring strips. The EFM strips remained off for a total of 4 hours during which time the baby suffered oxygen deprivation and permanent brain injury. The doctor was found to be negligent in failing to keep the mother on the EFM strips after inducing labor. Plaintiff v Hospital (Massachusetts 2017) $3 million: mother went to the hospital at 41 weeks with labor. When her water broke the amniotic fluid had meconium in it. Despite this very obvious sign of fetal distress, the doctors and hospital staff inexplicably failed to hook the mother up to any fetal monitoring devices and failed to immediately deliver the child, instead, allowing the mother to labor for hours with no EFM. When the EFM strips were finally hooked up the nurses allegedly failed to recognize the immediate signs of fetal distress. By the time an emergency C-section was done the baby had suffered a hypoxic brain injury and was stillborn. The malpractice claims were settled for $3 million. If your child was born with a birth injury negligent, we may be able to help you chart a course to put your child and your family in the best position economically. The birth injury attorneys at Miller & Zois can investigate your case and help you take appropriate action. Call us at 800-553-8082 get an online case review.